There are two interesting connections between Galactus and the Inhumans here, the first one being that one saga ended in the same issue that the other saga began. (Fantastic Four #48). But I want to discuss the second. It is easy to show the wonder Kirby created in his drawings. 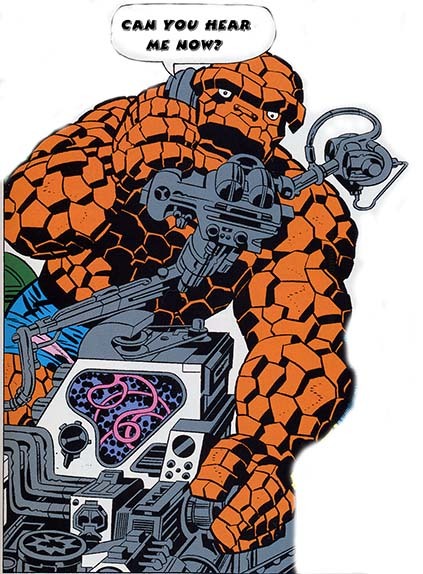 But I have always seen Jack Kirby as a storyteller first. His drawing board was his typewriter, his tool for creating great stories. He thought in images more so than in words. In the early 1960s, new comic book series were usually done by issue #20 or 25. That is, all the new stories were told and all the great characters were introduced. The companies knew they lost readers after a few years and so when you read the Flash, Green Lantern or the Atom, the stories began to decline and repeat themselves. Not so at Marvel, and especially not so with great storytellers like Kirby and Steve Ditko. As good as the Fantastic Four was from issue 1-25, it got better after that. And after issue #39, “A Blind Man Shall Lead Them,” it got even better; In fact, it entered the stratosphere. Kirby did not always develop new ideas, but took familiar concepts and developed them so well we don’t think of them as “Twice Told Tales” but they were. Recently, I read several discussions of “Where did Kirby come up with the X-Men?” People were discussing mutants, modern society and so forth. I don’t think they had to travel that far. The X-Men were a group of super-powered teenagers, all with different powers. They banded together with a father figure, Professor X, and there was rarely another parent in site. They lived as a family. Their enemies were mostly people of the generic material so to speak. Well, that was Asgard, home of Thor. Odin was the All-father to everyone, they all had different powers and they were all born with very different powers, but probably the same tailor. Kirby had also created many teen age groups, such as the Newsboy Legion and the Boy Commandos and they also away had an adult in charge. 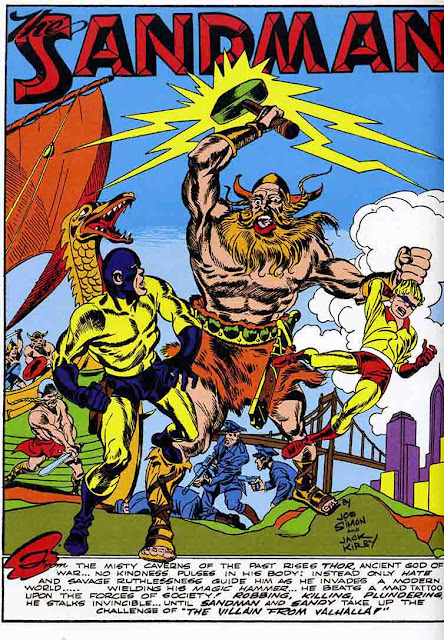 And Kirby even showed the “Boyhood of Thor” in “Tales of Asgard.” And mythology, as a place to find super-humans races was not at all new to Kirby, in the 1940s he drew Mercury and even another Thor. These groups always had family problems, Thor with Loki, Prof X with his brother, the Juggernaut. So when the Inhumans were introduced, in Fantastic Four #44, I saw a very similar structure to the Asgardians and X-Men, including the sibling rivalries. Down the road, of course, we would see a lot of this in the New Gods and Eternals. In Fantastic Four #48, the Inhumans siblings, Black Bolt and Maximus battle and Maximus wins. “I can create a negative zone around our land. A zone that nothing can penetrate.” And Maximus creates a barrier forever separating the Inhumans from Humanity. Of course, life goes on, and Galactus, led by his herald, the Silver Surfer, attempts to drain Earth of all of its energy. 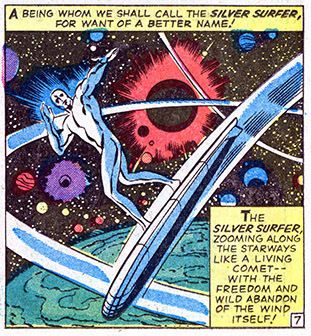 In issue #50, the Silver Surfer turns against his master and is punished for it. “Since you shall be herald to Galactus no longer. I shall remove your space time powers. Henceforth, the Silver Surfer shall roam the galaxies no longer.” And the Surfer is banished, stranded on Earth to live amongst the people he helped save. So what’s the link? A defeated Maximus punishes the Inhumans by imprisoning them in the Giant Refuge to keep them separate from humanity. Galactus does just the opposite he punishes the Silver Surfer by imprisoning him on Earth where he must forever mingle with the same humanity. There is a contradiction here. But which is the worst punishment?